Queen Rania of Jordan attended the Fight Night gala held for the benefit of the Andrea Bocelli Foundation and the Muhammed Ali Parkinson Center at Palazzo Vecchio on September 11, 2016 in Florence, Italy. 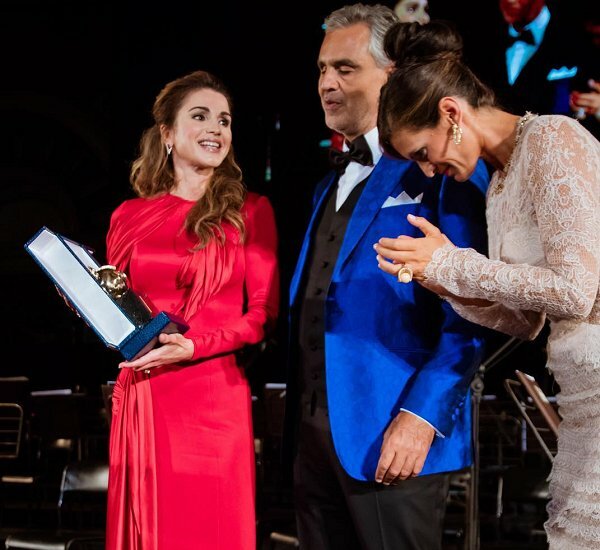 The Queen received the humanitarian award from the Andrea Bocelli Foundation in Italy on Sunday, in recognition of her advocacy for refugees, children’s rights, and community empowerment. The award has previously gone to George Clooney, Sofia Lauren, Lionel Richie, David Foster, Sharon Stone and Reba McEntire. Not a fan of this dress draping but I like its appearance seated. Maybe fabric was misplaced when she was walking in this series of photos. What an honor for her! Yes, it's an interesting dress. I can't really follow where the blue thing emanates from but I agree it looks unique from waist up (that is, when she is sitting). I also in general approve of the colour of the shoes to echo some detail of the dress and wouldn't say no to a surprising colour pairing either, however I have doubts about her shoe choice. I must say the Queen is an extremely good looking woman. I know she had some small surgery done (I think to her nose) but I don't care, I still think her raw material was exceptional to begin with and there is no plastic surgery that makes you as stunning as she is. And though I don't always like what she wears (in fact I often dislike it) she surely has style, is always appropiately dressed and I think she is as dignified (both fashionwise and her general appearance) as very few people nowadays. Weird light blue bows. Dress would look much better without them. Although this red is not any becoming color to Rania.